The cone snail kills prey with venom that disables neurons. Neurons are nerve cells that transfer information within the body. 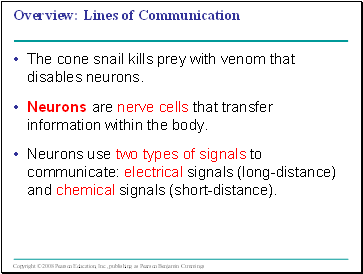 Neurons use two types of signals to communicate: electrical signals (long-distance) and chemical signals (short-distance). 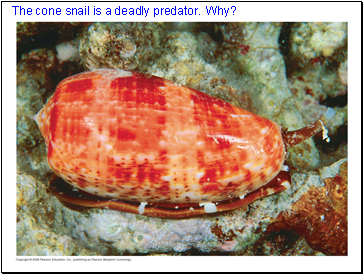 The cone snail is a deadly predator. Why? 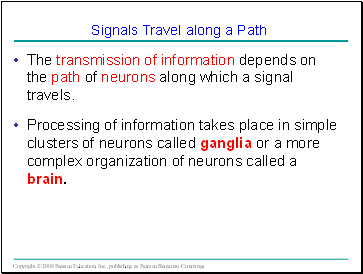 The transmission of information depends on the path of neurons along which a signal travels. Processing of information takes place in simple clusters of neurons called ganglia or a more complex organization of neurons called a brain. 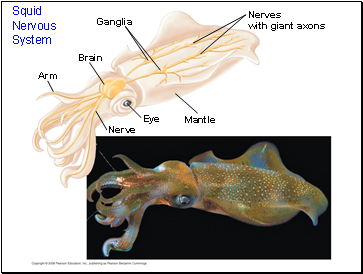 The squid possesses extremely large nerve cells and is a good model for studying neuron function. 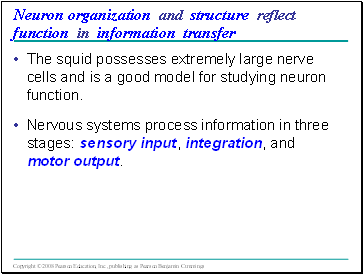 Nervous systems process information in three stages: sensory input, integration, and motor output. 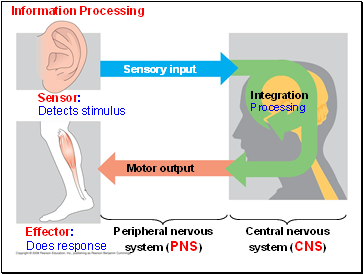 Sensors detect external stimuli and internal conditions and transmit information along sensory neurons. 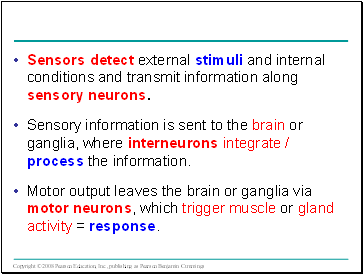 Sensory information is sent to the brain or ganglia, where interneurons integrate / process the information. Motor output leaves the brain or ganglia via motor neurons, which trigger muscle or gland activity = response. 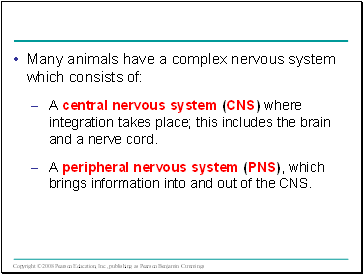 A central nervous system (CNS) where integration takes place; this includes the brain and a nerve cord. A peripheral nervous system (PNS), which brings information into and out of the CNS. 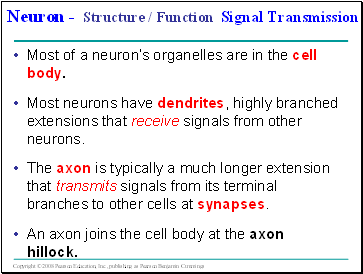 Most of a neuron’s organelles are in the cell body. Most neurons have dendrites, highly branched extensions that receive signals from other neurons. The axon is typically a much longer extension that transmits signals from its terminal branches to other cells at synapses. A synapse is a junction between cells.